Who can resist savory treats? Bella Cucina Sweet Roasted Peppers Pesto and Bella Cucina Lemon Artichoke Pesto are just the beginning. Accompanied by Bel Gioioso Provolone Cheese, Citterio Salame & Bruschetta toast. Candies, Guylian's Seashells chocolates, Cookies, Chocolate Pretzels, half a pound of New York Flavored or Columbian Coffee, Sparkling Cider or San Benedetto Peach Iced Tea, Nuts, Pretzels and Mustard dip. 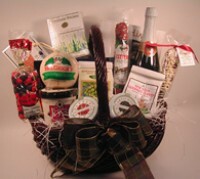 Call us to personalize this basket for you!